The End Of America | HOW DOES TRUMP COMPARE TO JEHU OF BIBLE? Rabbi Jonathan Cahn in his book the Paridigm, (now available on Amazon and Hope of the World.org,) shows the comparisons between Israel in God’s book, The Holy Bible, and the rulers of America now. The end of the Ahab/Jezebel (Slick Willie-Shillary) reign was the sudden intrusion of God’s will resulting in a President called Trump, which correlates with the fifty year Jubilee of Israel, i.e. blowing the TRUMP). His surprising victory could only have been orchestrated by God using the Christian Conservatives or what is often called the Evangelical Right, or the Conservative Right/Wing of the Republican party. God’s Word states that Jehu was considered a fighter, but according to Scripture, there was a highly religious holy man called Jehonadad Jehu met on his way to the capital city. Actually Jehonadad went to meet Jehu. Here were two entirely different men, one holy, the other never having heard of another way to live then “if it feels good do it”. Our correlation is that instead of a single holy man President Trump has a religious advisor called the “religious right”. And then there is Vice President Pence too. 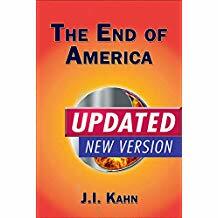 Jonathan Cahn goes on to list all the possible “comparisons” which makes the Paradigm a very exciting book, quoted frequently in The End of America book, by J. I. Kahn, also available on Amazon.